This exceptional antique George V sterling silver bottle coaster has a plain cylindrical form to a swept spreading base with a collet style rim. The upper portion of the body is embellished with a broad shaped band of pierced scrolling foliate decoration accented with quarefoil leaf motifs. 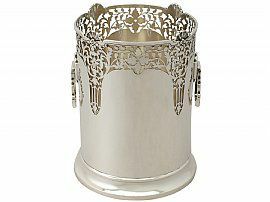 The solid silver body is further decorated with an applied moulded border accented with four leaf and floral designs. 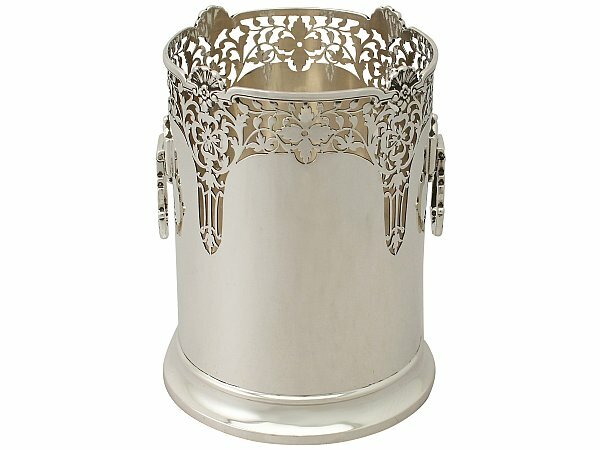 This silver bottle coaster is fitted with two Art Deco style hallmarked hinged handles accented with single scrolling leaf designs to the handpeices in addition to pendant drop styles to the sockets in juction with the body. The solid silver base of the coaster bears the retailer's mark 'Mappin & Webb Ltd, Sheffield & Sheffield'. NOTE: The majority of such bottle coasters have a wooden base; it is a sign of superior quality when coasters have unlined, solid silver bases. This antique bottle coaster is an exceptional gauge of silver, exceptional quality and in exceptional condition. The applied and pierced decoration is all very sharp. Full hallmarks struck to the surface of the body, in addition to the part hallmarks to the reverse of the handles are all very clear.